I’m guessing you barely ever think about the condition of your RV’s awning. It’s probably the last thing on your mind, especially, when there are other more important parts of your RV to worry about such as your tires or breaks. But I’m here to tell your awning should always be on your mind. If you don’t take care of it, the price to replace your awning is astronomical. In fact, it’s downright bank account breaking. However, with right maintenance and the best RV awing cleaner, you’ll never have to worry about replacing this expensive RV part. Honestly, with the proper care, your awning shouldn’t ever need to be replaced. And that’s why we’re going to help you find the best RV awning cleaner for your particular needs. We’ll do this by providing you with all the information you’d ever need to know about RV awning cleaners. Also, we’ll have detailed reviews of the top RV awning cleaners in the world to give you a sense of what cleaner might be the best for you. And once you find the perfect cleaner, you’ll never have to worry about your awning’s condition ever again. As promised above, this section will provide you with detailed product reviews of what we consider the right RV awning cleaners on the market. With these detail reviews, you’ll gain a better idea of what is out there and what to look for in an RV awning cleaner. Our first product, the B.E.S.T. 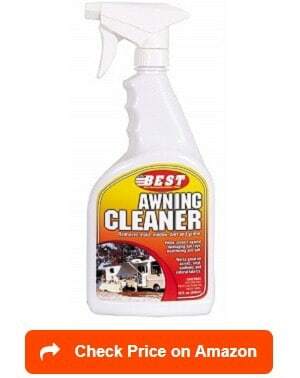 Awning Cleaner, literally lives up to its manufacturer’s name; it really is one of the best. And considering it’s one the best, it’s in your interest to consider this awning cleaner for a variety of reasons. For example, I love how easy this cleaner is to use. See, all you have to do is spray and hose it off. Honestly, how easy the cleaner is to use might be the most essential factor in picking your awning cleaner. As you know, sometimes products can get a little complicated to use. But with this product, it’s a comfort that all you’ll need is a spray bottle and a hose to get the full benefits out of this wonderful cleaner. And once you do start using this cleaner, the results are fantastic as it removes mildew, mold, and other issues rather quickly. As someone who uses their awning quite frequently, this is incredible news. Also, I wouldn’t have to worry about my awning falling victim to sun damage either as this cleaner offers protection against those dangerous UV rays. Just another thing, I wouldn’t have to stress over. But the best part is that it comes at a low-cost. After all, if you can’t afford the product, none of these features would matter. At this price, I’m confident that wouldn’t be an issue. However, there were some issues I did find in my research such as when customers tried to return the product for whatever reason; the company didn’t offer a refund policy, which is a little concerning. The product also seemed to have some problems getting rid of extreme cases of black mildew. So, if your issue is extensive, I’d recommend buying a different awning cleaner. The Camco Pro Strength Awning Cleaner is a versatile and handy cleaner that’s made by a company known for producing exceptional products. And this awning cleaner is no different. For instance, this awning cleaner can be used on any fabric. So, you don’t have to go through the hassle of trying to research whether or not it will damage your awning. Honestly, it’s a real time saver. Along the same lines, I love that this awning cleaner can be used on other surfaces such as pop-up campers or tents. As someone who likes camping, this cleaner could be handy for cleaning my tent. In other words, I love products that can be used in multiple ways. Honestly, being multi-use makes me feel a lot better about buying a strictly awning cleaner. Otherwise, I don’t know, if I’d feel like it was worth it to buy something, I’d only use once every couple months. And the fact that it’s incredibly efficient at getting out all those pesky, issue-causing substances is another positive this awning cleaner has going for it. I mean, it could have all the features in the world, but if it doesn’t superbly clean your awning, what’s the point? Well, there would be no point. But regardless of its overall quality, there are a few issues I have with this particular awning cleaner. First, it isn’t biodegradable, which is a massive deal breaker for me; See, I know, I’m going to spill this cleaner at some point and don’t want to danger the environment doing so. Second, there were a lot of complainants that this cleaner didn’t do well against black streaks. As someone who’s looking for a cleaner to get out black streaks, you could see how this would be a problem. Are you looking for a multi-purpose awning cleaner? Well this cleaner, the Bugs N All Professional Strength Multi Surface Vehicle Cleaner, might be the awning cleaner for you. As you would expect from any top-notch awning cleaner, this product has a real knack for getting rid of those nuisance substances that cause real issues. But besides being an effective cleaner, it has other features that are extremely useful. For one, it can work on a myriad of vehicles from RVs to cars. Therefore, no matter the vehicle this cleaner will get out those stains that have become all too familiar. There’s nothing more frustrating than seeing the same stain day after day. With this product, this sense of frustration would be a thing of the past. You simply spray this on and watch the stain rinse away. Honestly, it’s nice knowing that this cleaner can do everything it’s advertisement claims it can do. In all aspects, this cleaner is just a great product to have lying around. You’ll never run out of reasons to use this cleaner as it can help clean up any spill or stain you would encounter. Plus, it comes with its own spray bottle. The inclusion of the spray bottle is just another reason I love this product. It’s just incredibly convenient and practical for any RV owner to have. But there’s one significant issue that we can’t overlook; the price is rather expensive. I doubt you’re looking to spend this much on something as simple as an awning cleaner; I know I’m not. The Thetford Premium is a worthwhile option that any RV owner would benefit from purchasing. It has a variety of features that would help keep your awning clean and in pristine condition. For example, I love how this cleaner helps protect your awning against those pesky UV rays that can cause a lot of damage. It’s a must for me to have some UV protection. See, I plan on having RV exposed to a lot of sun during the summer months. And an awning that could stand up to the blistering heat could be extremely useful. With this cleaner, I wouldn’t need to worry about overusing my awning in those hot summer days. But besides offering protection against the sun, this product is simple to use. See, you put the cleaner into a spray bottle and spray it on your awning. Then, you either rub it in with a water rag/ towel or use a hose. Sounds easy right? Well, it is, and it’s proven to be extremely effective at getting rid of those pesky stains. Honestly, there are no qualms about this cleaner’s performance; it’s top-notch. And further speaking to its quality is that its biodegradable. Anytime a product’s biodegradable you know it’s gone through rigorous testing; therefore, you know the company has invested a lot into this product. However, all these features do come with one issue; the price is very high. Sadly, the price being this high means it’s probably out of my price range. This isn’t ideal because it really does cover all the bases of what I need out of my RV awning cleaner. Maybe, I’ll decide to splurge a little bit? One of more user-friendly options on this list is the 303’s Multi Surface Cleaner Spray, which would be an excellent addition to any RV owner’s life. See, as the name suggests, this cleaner can be used on many different surfaces. And on each surface it’s used, it quickly erases whatever stain, grease, or grime you want to be gone. In fact, it will clean any water-safe surface; theoretically, you could wash your whole RV with this wonderful product. Furthermore, it’s made in the USA, which makes me feel more confident about buying this cleaner. See, if a cleaner made in the USA, you can feel a sense of comfort that it had the rigorous testing done that any USA based product must go through before going on the market. Even with the cost of this testing, the manufacturer still graciously made this product relatively affordable. As someone who’s looking for a bargain, seeing something of this much quality at this price is a welcomed sight. With all this in mind, it’s no surprise that I love this product. It, even, has four different buying options to choose from for peak convenience. In my opinion, it’s always nice when the company offers you different quantity options. As you probably figured out by now, there’s nothing I value more than convenience. And with numerous buying options, this cleaner is nothing but convenient for any customer who chooses to buy it. But there’s one glaring issue I have with this cleaner; it doesn’t have UV protection. As stated before, this feature is something I consider an almost must-feature for my camper awning cleaner to have; therefore, I wouldn’t feel comfortable buying this one. 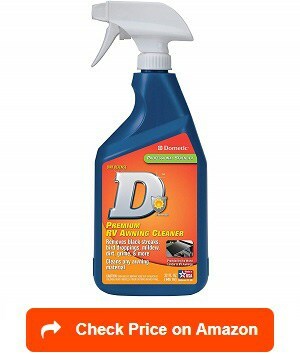 Of course, if you’re not as concerned with UV protection as me, this cleaner could end up being a steal. I mean, look at that price and all those features, it really is a high-quality cleaner. 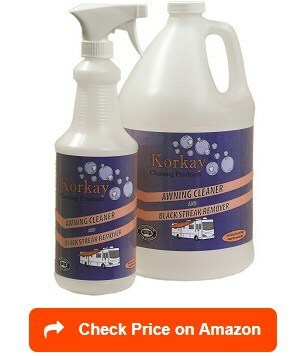 Another easy to use product, the Korkay’s Awning Cleaner, comes from a well-respected company called Korkay. And with this in mind, you shouldn’t be surprised that this product is very adaptable. In being so, this cleaner can be used on many different vehicles such as boats and cars. This multi-purpose use is something I truly value in any RV awning cleaner I consider buying. It’s just too useful to pass up. Along the same lines, this cleaner can be used on any surface your RV may have such as the rubber roof. It’s another reason this product needs some serious consideration from any RV owner looking to clean up their awning. Moreover, the best part thing about this cleaner is how effective it’s at the job it was created to do. It cleans up mildew, dirt, black streaks, or mold quickly and makes the awning look brand new. 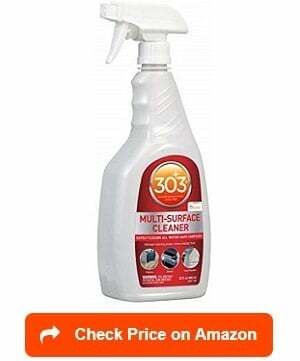 With this product, you could have your awning or boat looking brand new in one cleaning. And as mentioned before, it’s effortless to use; you spray the cleaner on the surface and wipe away the stress-causing stain. But as most incredible products do; it comes with a price I’m just not willing to pay for an awning cleaner. In my opinion, this cleaner doesn’t represent a bargain for my particular needs. However, for someone willing to pay a little extra, this cleaner could do wonders for your awning and maybe even clean up some other vehicles in your life. Honestly, I couldn’t find one utterly negative review about it, so, it’s proven to be a high-end cleaner. In other words, there’s not much you can complain about this cleaner. It’s genuinely everything an RV owner is searching for, especially, one that has an awning with awful mold issues. 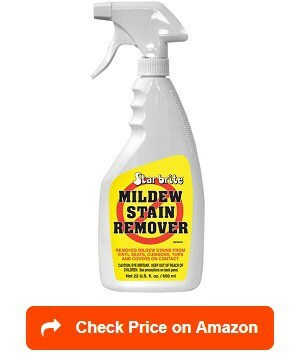 As one of the most convenient products on this list, the Star Brite Mildew Stain Remover is an RV awning cleaner that’s very high on my preferred product list. In all estimations, it’s an insanely useful product. In being so useful, I’m shocked at how affordable this cleaner is; it’s one of lowest costing products on this list. And this low-price doesn’t affect its overall performance. In fact, it’s proven to work on any stainable surface; therefore, it’s incredibly adaptable. With my proclivity for clumsiness, this cleaner would be an excellent product to have lying around. Other than being good at it’s intended purpose, it’s ridiculously easy to use. See, you can get the cleaner in a spray bottle design, so, all you have to do spray, scrub lightly, and the stains will be gone. It also has three different buying options; so, you can pick the quantity that fits your preferences the best. After all, regardless of the product you intend to buy, there’s never anything wrong with having a choice. And since it’s made in the USA, you know it’s gone through heavy testing. I’m always more comfortable buying from a USA based company for the assurance that the product will be tested to its fullest capabilities. But even with all these positives, there was one area where Star Brite seemed to fail: packaging. Apparently, the cleaner tends to leak through the packaging into the shipping box. I know this sound weird; however, multiple customers had reported this same issue. Overall, a shipping issue like this one isn’t a great look for a company with such an incredible product. If I planned on buying this product, it’s definitely something I’d take into consideration before purchasing. The Wet and Forget Moss Mold Mildew & Algae Stain Remover would make any RV owner’s life much more relaxed in many different ways. Honestly, there’s not a lot I don’t love about this product. First off, it’s biodegradable which appeals to my annoying habit of spilling things. With this product, I can sleep comfortably knowing my spilling of this cleaner wouldn’t harm the earth in any way. Moreover, it’s ability to get rid of moss, mold, and other stain problems quickly is another feature anyone could benefit from; it’s just exceptionally at doing its job. In other words, you won’t be disappointed with the results you get from this cleaner. It’s also safe to use on all surfaces, which makes it not only useful to your RV’s awning but other stainable surfaces as well. With these capabilities, it’s no shock that this product is among the best of its kind. Other than being versatile and exceptionally at its job, there’s not much else that stands out about this product besides it being easy to use and coming in three different buying options. Although there was one concerning issue that was prevalent in the customer reviews, this cleaner seemed to have trouble getting rid of black streaks. As an RV owner, this issue isn’t something you’d like to hear about an RV cleaning product you’re considering. And it’s rather expensive for an RV awning cleaner. I mean, it’s a high-quality product and all, but at this price, I’d probably opt for a cleaner that has shown it can handle black streaks. 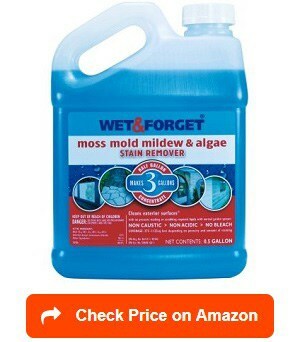 But if your problem is more on the mold, moss, or algae side of the spectrum, this cleaner might be the one for you. Honestly, with dealing with those three issues, there might not be a better product on this list. 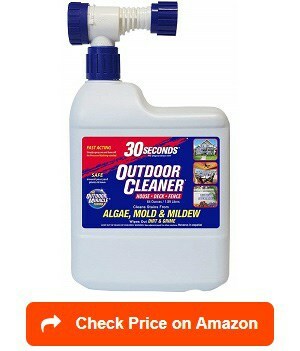 Our second to last product our list, the 30 Seconds Outdoor Cleaner is one of our most unique ones. See, it comes with a hose end sprayer at the top of the bottle of cleaner. Therefore, making this product one of the easiest to use on this entire list! With this hose end attachment, you should have no problems quickly wiping out the mildew, molds, or other substances harming your awning. In fact, I suspect it will be so easy to use you won’t even break a sweat. Honestly, the hose end attachment might be the most useful feature of any product on this list. It just allows for such easy use, and I wish more of these products had this attachment. And with this attachment, I’d be okay with what I’d typically consider a high price. I mean, it does make this cleaner an extraordinarily versatile and convenient product for an RV owner to have. Other than the hose end attachment, this product is pretty run of the mill. It’s biodegradable which is obviously a nice feature to have, and it can work across most water-safe surfaces. But other than that, there isn’t much more to say about what makes this product great. But there is more to say about it’s one single flaw; some customers have reported that this cleaner seems to damage metal. As an RV owner, I could see how this could be very problematic. And given this issue, I’d have a hard time justifying buying this product even though I absolutely love the hose end attachment. It’s just too glaring an issue to have in an RV awning cleaner. The last product on our list is the Dometic Premium Awning Cleaner, which is definitely worth your time and consideration. Now, there isn’t some unique feature that makes this product extraordinary, but it’s a high-quality cleaner ready to get rid of all your mildew issues. 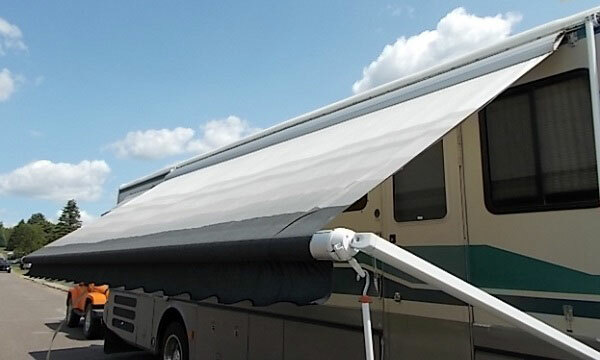 And it has the inclusion of one of my favorite features an RV awning cleaner can have: the ability to protect your awning against the damage caused by prolonged exposure to UV rays coming from the sun. Besides this essential feature, it’s got a spray bottle design that makes it incredibly easy and handy to use on multiple surfaces. When applied on these surfaces, this cleaner quickly destroys problematic stain or issues. Honestly, Dometic covered all bases with this product. It’s an efficient, quick stain killing cleaner that will appeal to a lot of RV owners because it’s versatility and ease of use. Also, it has one more selling point; its price. This product falls well in the range of being affordable for any RV owner looking for a bargain. In all imaginable ways except one, this product seems to be everything you’d want. But as mentioned above, there is one area this product seems to fail consistently; cleaning up bug stains. 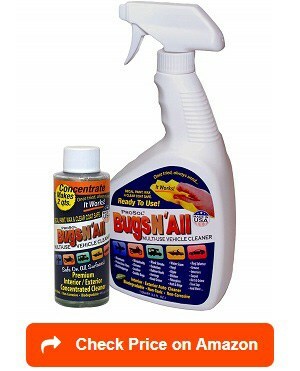 Several customers have had issues with this cleaner not cleaning up bug stains. And as any RV owner knows, at some point you’re going to get some bug stains on your awning or RV. It’s just a part of being an RV owner. Therefore, it’s kind of hard to see myself buying this cleaner. After reading through all the product reviews, you’re probably wondering how you’re going to pick only one of these fantastic products. Well, this section will have you decide precisely what you want out of your RV awning cleaner to help with that choice. What Type of Fabric is Your Awning? (Vinyl or Acrylic) – In the RV awning world, there are two types: vinyl and acrylic. And some RV awning cleaners are specially made for each type. Therefore, you must know which fabric your awning is made from to ensure you’re getting the right cleaner. If you don’t, you could cause real damage to your awning. So please, make sure you take into account what fabric your awning is and make sure the cleaner you’re considering is compatible with that type of fabric. Regardless of your awning’s fabric type, there should be a high-quality travel trailer awning cleaner that will fulfill every need you’re looking for out of this product. But, it’s something you need to know to ensure you avoid purchasing a cleaner that will damage your awning. As you probably know, replacing an awning can be rather expensive, and I’d like to help you avoid doing so in any way I can. Trust me; the last thing I want to see happen is you spending 300 dollars on an awning replacement. All in all, it’s probably better if you get an RV awning cleaner that can be used on both vinyl and acrylic like most of the options in the product section are; it’s just easier than having to research specifically for a vinyl or acrylic RV awning cleaner. 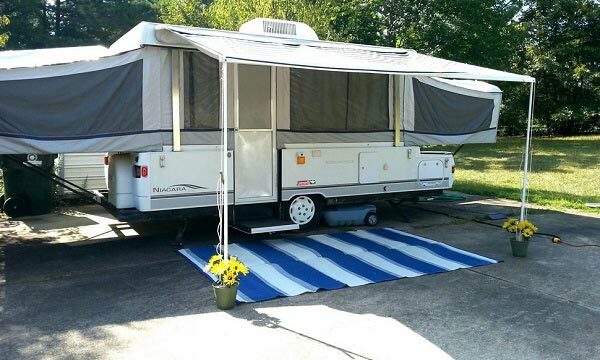 Warranty/Refund Policy – When possible, always get an RV awning cleaner with a warranty. Let’s be honest; companies will lie about the capabilities of their products. RV awning cleaner manufacturers are no different. Instead, make sure you pick a cleaner with a warranty or refund policy just in case the cleaner doesn’t do what it’s advertised to do. Also, it will help you weed out the bad companies from the good ones. After all, no company who’s trying to scam you is offering a refund or warranty. It defeats the whole concept of scamming people. Therefore, a cleaner with a refund or warranty is definitely what you should be looking for: it’s a layer of protection against these scammers. Features – As you might expect, certain cleaners offer different features from others. For example, a cleaner might protect your awning against UV rays or have an inclusion of a spray bottle. With this in mind, you must decide on the features you want your RV awning cleaner to have; do you want an additional spray bottle? Do you want protection against UV rays? Are you looking an RV awning cleaner that can clean other vehicles? The answers to questions such as these will help you find the best RV awning cleaner for your particular needs. Is it Biodegradable? – One aspect of an awning cleaner buying most people overlook is whether or not the product is biodegradable. I know, some of you won’t care about this, and that’s fine. But for environmentally conscious, people this issue is a big deal. So if you’re one of these people, please make sure the awning cleaner you’re getting is biodegradable. If you don’t, every time you use the non-biodegradable product, you’re risking a spill that could seep into the ground and hurt the soil. If you’re not environmentally conscious, it might still be ideal to pick a biodegradable cleaner because it conveys that the company is of high quality. See, it means the company put their product through numerous more tests than a non-biodegradable product’s company did..
Quality – If you take any piece of advice from this article, please take this one: read customer reviews before buying a cleaner. I know, this seems like common sense, but you’d be shocked at how many people take these companies at their word. Instead, be a person who views multiple customers reviews to ensure you can be fully confident in the product you’re buying. Honestly, these reviews are there for a reason let them guide you toward making an informed decision. And isn’t that why you clicked on this article in the first place? So, take this advice seriously and gather all the information you need to make a decision you feel confident about making. What is an RV awning cleaner? RV awning cleaners are specialized cleaners meant to deal with the substances that ruin your awning’s vinyl or acrylic fabric. In other words, the manufacturers realized these were unique surfaces and needed a specific cleaner to keep them in good condition. With any awning, their primary purpose is to ensure your awning will always be there for those hot summer days. After all, everybody needs a place to cool down and escape the blistering heat of the summer months. And with the right RV awning cleaner, you’ll always have a product that can help keep your awning in pristine condition. Without it, your awning could fall victim to many different issues. Well, it depends on the cleaner you opt to get. But for the most part, it’s a simple spray on and rinse off type of cleaner. Therefore, if you don’t already have a hose or spray bottle, it’s essential you get one. Sometimes the cleaner themselves will come with a spray bottle included, which eliminates the need for you to buy one separately. And if you don’t have a hose, you could always do it by hand with a rag or towel. Once you decided which method to use, you apply the awning cleaner onto the surface and watch it wash away those awful black streaks. Of course, this result will only happen with a high-quality RV awning cleaner. In the end, it’s about what method is most convenient and comfortable for you. And once you figure out the process you want to use, pick an accommodating awning cleaner that can be used in that way. Why do you need an RV awning cleaner? There’s a straightforward reason for needing an RV awning cleaner: replacing an awning is a costly nuisance that’s isn’t worth the hassle. See, the mildew and other substances that awnings are prone to attract can cause irreversible damage without proper maintenance. Due to this, it’s essential you get yourself a high-quality RV awning cleaner so you can avoid paying the expensive price later. And it’s just such a simple/affordable solution that will keep your awning in peak condition. After all, don’t you always want the option to shield yourself from the blistering sun during those hot summer days? With proper maintenance, your awning will always be there to offer you some shade. In the FAQs section, we’ll try to cover any leftover questions about RV awning cleaners you have rattling around in your mind. Hopefully, you’ll find the answers to any remaining questions that you have in this section. 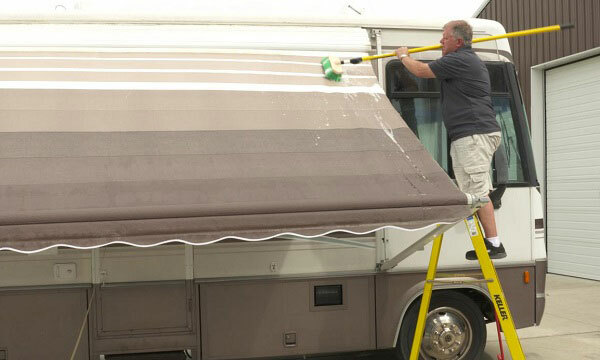 What is the best way to clean RV awning? 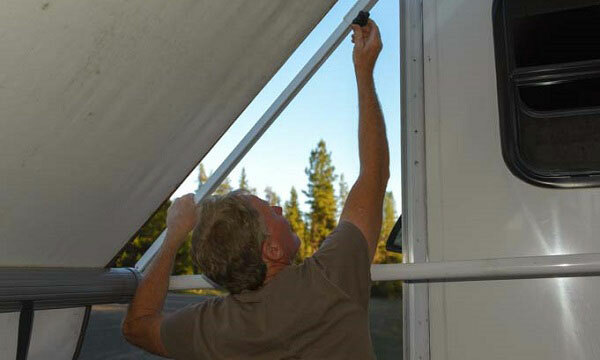 In general, cleaning your RV’s awning is a relatively simple process. It’s about what you’d expect from cleaning any other part of your RV. But to give you some guidance, here an eleven-step guide from Wikihow that will help ease any anxieties you may have. I know, eleven steps may seem excessive, but trust me; they do an excellent job of laying it out in a detailed and pain-free way. Where to buy RV awning cleaner? 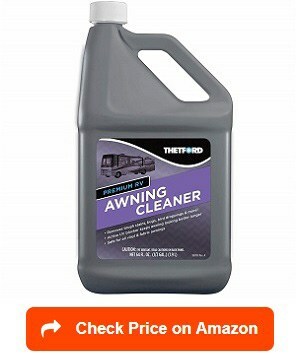 As with most products these days, the place to buy RV awning cleaner is online sites like Amazon. 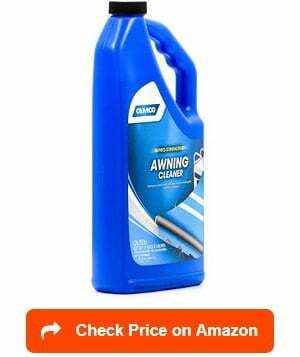 In fact, all the awning cleaners from our product section with have hyperlinks that bring you to their accompanying page on Amazon. Otherwise, you can buy awning cleaners at places like Lowes, Home Depot, etc. You know the places you’d expect to have RV supplies. In my personal opinion, you’re probably going to get the best deal on sites like Amazon. After all, there’s a reason Amazon’s the biggest marketplace in the world right now. So, don’t overthink it and use Amazon to find a good, reliable awning cleaner. Trust me; there’s no place better. Now, that you’re an RV awning cleaner expert, I suspect you won’t have any trouble finding the best RV awning cleaner for RV. Honestly, with all the information above, this process will cause very little stress and should be painless. In the end, it’s all about not overthinking it and trusting all the new information you just read. And if you do, I’m fully confident you’ll find the awning cleaner that you’ve been looking for, and it will keep your awning in pristine shape for years to come. We would like to thank you for reading this article. Find out more about how to choose the best RV wash and wax and best RV wax with our reviews and ratings. Furthermore, please take a look at the best RV roof coatings and sealants, best RV caulks and best RV roof cleaners to choose the right one for your RV cleaning, storage and maintenance.